Point 1: The word "bidah" (البدعة) (innovation) and "muhdathah" (المحدثة) (newly-invented matter) have both been used by the Messenger (alayhis salaam) in a blameworthy sense and all Scholars of Ahl al-Sunnah are agreed that bidah in the religion (in matters of worship and getting closer to Allaah) are all forbidden because Allaah completed the religion through the Messenger (alayhis salaam) and the Messenger left nothing which brings a Muslim closer to Paradise except that he has already informed us of (either in its foundation, or in its detail) - refer to this article for proof. Point 2: We have to make a difference between using words with their linguistic meanings and with their Shariah meanings because the Shariah, when it uses certain words and terms, intends meanings above and beyond the mere linguistic meaning and definition. To give some examples, the word salaah (الصلاة), prayer, literally means du'a (الدعاء), supplication. This is its pure linguistic meaning. However, in the Shariah, it means much more than supplication and refers to a collection of inwards states and feelings, statements and outward actions, without which there can be no prayer, as defined by the Shariah. Another example is (الزكاة), charity, linguistically it actually means purity, yet in the Shariah, it has a conceptual meaning that goes beyond the linguistic meaning. Often Shariah terms qualify, restrict, or expand the linguistic meanings, and hence when using terms, once must be operating upon the Shariah defined meaning to avoid confusion and ambiguity. Point 3: The issue we are facing here then is that in various statements of the Scholars (which are used by others to justify bidah in matters of worship), how is the term bidah (البدعة) being used and defined and what is being included within it (or excluded for that matter)? This is the area in which deliberate confusion has been created by the Innovators of today, and they use as argument the sayings of certain Scholars which they do not really understand and who in no way at all, intended what these people intend by misrepresenting their statements to justify their own departure from the Sunnah of the Messenger (alayhis salaam) and the way of the Companions. This should now set the scene for this series of articles and we will demonstrate by Allaah's permission, that in reality, these scholars (like al-Shafi'i, al-Izz bin Abd al-Salam, Ibn Hajar, al-Nawawi and others) are innocent of the deception and lies of those who claim to be following them in their understanding of bidah. It is known that the innovators, and in particular the Sufi grave-worshippers of our times, rely upon the statements of some Scholars who applied the five rulings (wajib, mustahabb, mubah, makrooh, haram) to the topic of bid'ah, or who may have spoken of innovation (bid'ah) as being both good and bad. What they do not reveal though is that these scholars are simply using the word "bid'ah" in its broader linguistic sense, and not strictly in its Shari'ah sense. If we consider this, then we can say that the differences between them and between those who say that all innovation is evil (meaning by that the Shari'ah definition only), is largely a difference of wording only, and that the former scholars are simply including other matters into the broader linguistic definition of bidah.At the same time, we can see clearly in their other speech (and their fatwas and rulings) that they warn against innovation (in worship) and opposing the guidance of the Messenger and performing worship in a manner other than that known in the Sunnah or adding to it or changing it. The purpose of this brief article is to put on the record that Ibn Hajar al-Asqalani has alluded to this point, and we will then use this article as part of others when we build our case in order to demolish the roots and foundations of the innovators of our times who have played out this deception of confusing between what is a rejected bidah idaafiyyah and between what some Scholars enter into the linguistic useage of the word bid'ah of matters of public interest (which may relate to religious or worldly affairs) or what does in fact have a basis in the Shari'ah, such as the tarawih prayer revived by Umar bin al-Khattaab which is established to have been a Sunnah, but was abandoned by the Messenger for a specific reason). As for innovations (البدع), it is the plural of innovation (بدعة) and it is everything which does not have any prior example. Linguistically, [the word] encompasses what is both praiseworthy and blameworthy. In the usage of the people of the legislation (i.e. Scholars) it is specifically for what is blameworthy and if it is used in connection to what is praiseworthy, then it is upon its linguistic meaning. And "the newly invented matters" (المحدثات), with the fathah on the daal, is the plural of novelty (محدثة) and what is intended by it is what has been newly-introduced and does not have any basis in the legislation. It is referred to in the usage of the Shari'ah as innovation (بدعة). As for what has a basis indicated by the Shari'ah then it is not an innovation. 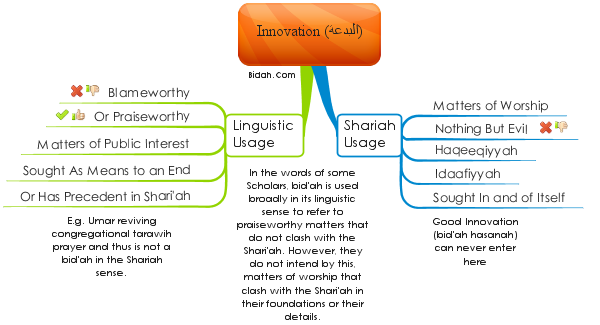 For "innovation" in the usage of the Shari'ah is blameworthy as opposed to its usage (with its) linguistic (meaning), for everything that has been newly-invented without any prior example is named "bid'ah" irrespective of whether it is praiseworthy, or blameworthy. These two statements from Ibn Hajar al-Asqalani (rahimahullaah) allow us to develop a context by which we can understand the true and real intent of those who have spoken of "good bid'ah". It is this context that the dishonest innovators and deviants wish to conceal and remove as part of their ploy to deceive the common folk in order to justify their multitude of relative innovations (bidah idafiyyah - see this article) which are censured in the Shariah and which they try to justify by confusing them with matters which have been entered into the linguistic application of this term by a number of scholars. We will address the sayings of Imam al-Shafi'ee, al-Izz bin Abd al-Salam, al-Nawawi, Ibn Rajab al-Hanbali and others in due course inshaa'Allah. And bidah is of two types. Sometimes it is a bidah shar'iyyah (with its Shariah meaning), such as his saying, "For every newly-invented matter is an innovation and every innovation is misguidance..." and sometimes it is a bidah lughawiyyah (with its linguistic meaning), such as the saying of Amir al-Mu'minin Umar bin al-Khattaab regarding his uniting them together for the Tarawih prayer and making them maintain this practice, "What an excellent innovation this is..."
This indicates that there is no such thing as "good bidah" in the Shariah, and where bidah is spoken of in a praiseworthy sense, it is only being spoken of with its linguistic meaning. To distinguish between these two makes it much easier for us to grasp the nature of the perception of some of the Shafi'ite jurists in their classifiation of bidah. This we will investigate in the following articles in this series.